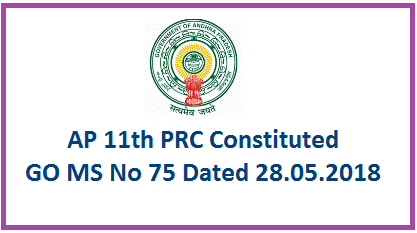 Appointing of 11th PRC Pay Revision Commission in AP GO 75 Download Appointment of 11th Pay Revision Commission – Orders – Issued. In supersession of the orders issued in the G.O. 6th read above, the following orders are issued: The Pay Scales of the State Government employees were revised with effect from 01.07.2013 with monetary benefit from 02.06.2014. The Joint Action Committee of Employees, Teachers, Workers and Pensioners, Andhra Pradesh, Vijayawada; the Andhra Pradesh Non-Gazetted Officers’ Association, Vijayawada; the APJAC of Employees, Teachers, Workers and retired employees Associations (AP JAC Amaravati); the Andhra Pradesh Secretariat Association and other Service Associations have represented for constitution of 11th Pay Revision Commission for the State Government employees. The Government have considered the representations and after careful examination, have decided to constitute the 11th Pay Revision Commission for the State Government employees. Accordingly, Government hereby constitute the 11th Pay Revision Commission. Orders for appointment of Pay Revision Commissioner will be issued in due course. To examine as to what extent the existing DA may be merged in pay and, to evolve consequent new set of pay scales merging DA therein and to suggest the mode of fixation of pay in the Revised Pay Scales. To study the Automatic Advancement Scheme as modified from time to time keeping in view the anomalies that have arisen during the implementation of the said scheme and also to examine whether the said scheme should continue in its present form and to make the recommendations in this regard. To examine the need for various Special Pays, Compensatory and various other Allowances and other perquisites in cash or kind now allowed and to make recommendations regarding their continuance or otherwise and if continuance is recommended what modifications, if any are deemed, desirable with regard to their rates, terms and other conditions which should govern them in future. To examine and review the existing pension structure for pensioners, and make recommendations which may be desirable and feasible. Review of the existing human resources of all departments in tune with the contemporary requirements including contract/outsourcing personnel particularly in the context of State bifurcation. To give its recommendations on any other matter referred to it by the State Government during the tenure of its office. In formulating its recommendations, the Commission may take in to account the overall financial position of the State. The Pay Revision Commission may lay down its own procedure for receiving representations, examining witnesses and calling for information. The Departments of Secretariat and Heads of Departments shall furnish all necessary information as and when required by the Pay Revision Commission and extend such co-operation and assistance as may be required by him. The Pay Revision Commission will ordinarily function from Velagapudi, but may tour within or outside, the State, if necessary. The Pay Revision Commission will submit its report to the Government within a period of one year from the date of assumption of charge of the Pay Revision Commissioner.